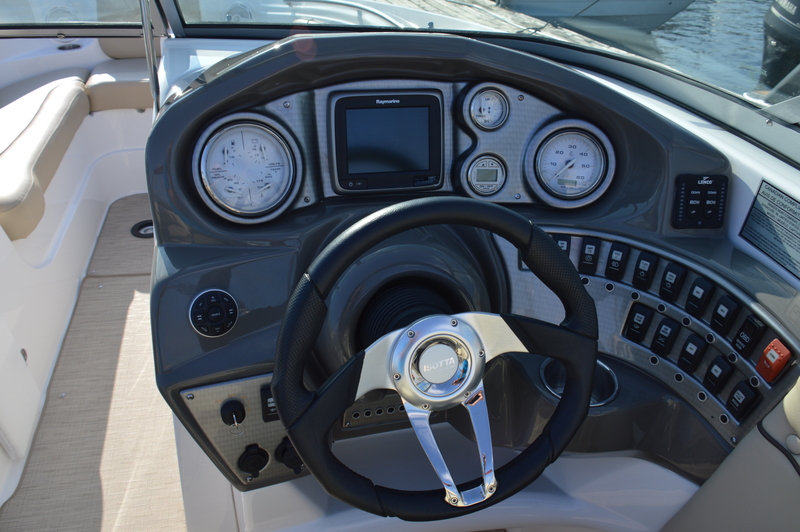 If you’re in the market for a used, but reasonably new boat you might want to check dealer inventories for one to two year old trade-ins, previous season’s demos or non-current inventory. They often come with the latest technologies and creature comforts without the brand new price tag. 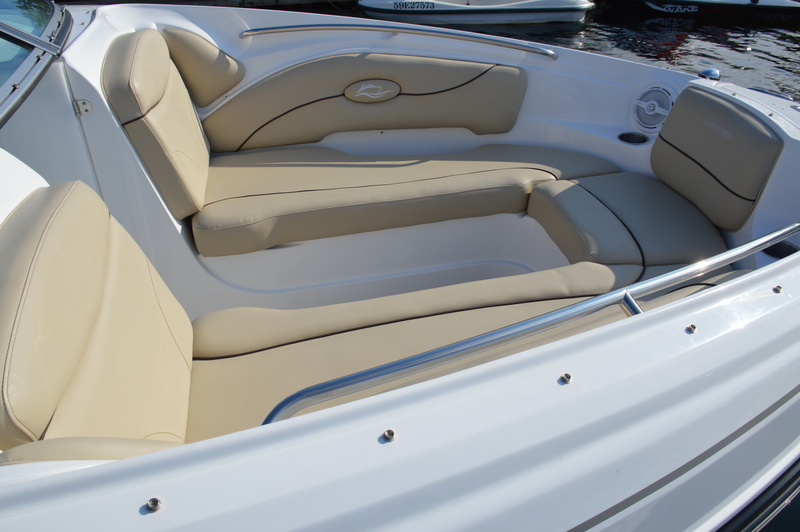 Looking around this past summer we found a trade-in that fit the bill, a 2015 Rinker Captiva 276 Bowrider. 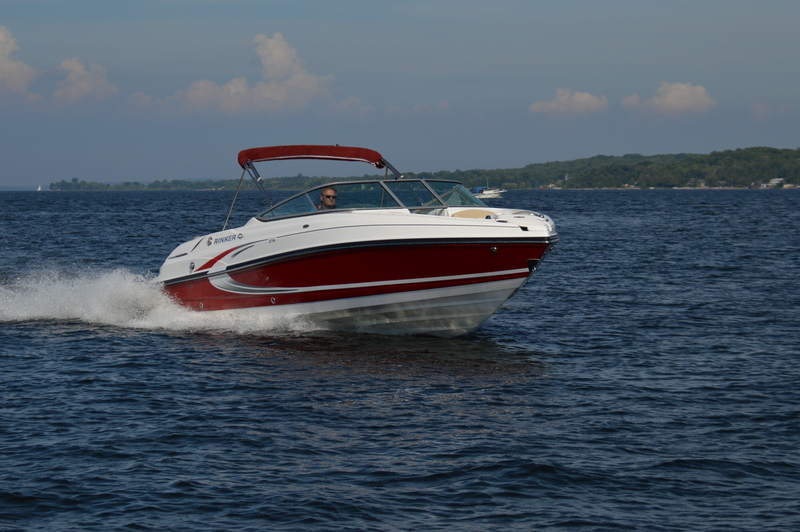 The second largest model in the Captiva lineup, the 276 is a roomy and comfortable day boat. 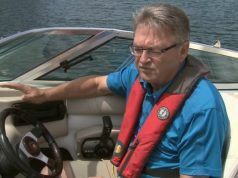 At the stern, it’s quite evident that Rinker’s focus is fun on the water. 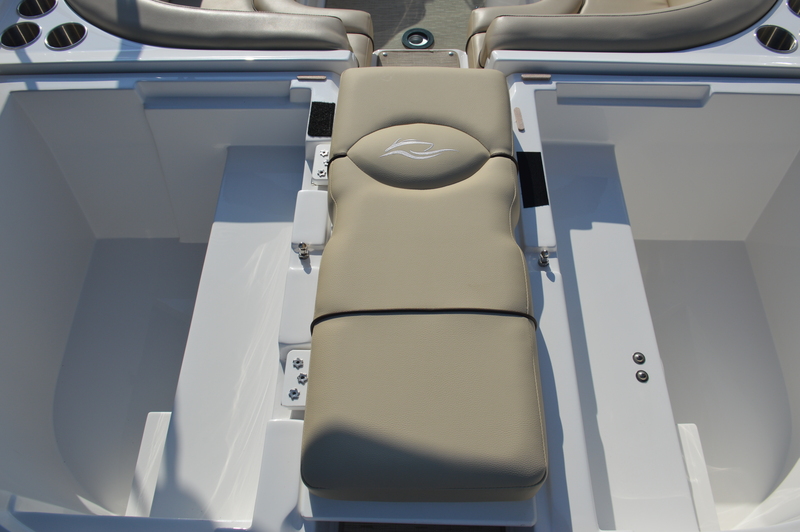 Whether gearing up for wakeboarding, swimming or just lounging, the large swim platform and transom seating will be appreciated. For chilling aft there are drink holders, a stereo remote and additional speakers. Got wet gear? Stow it under the transom seats. One feature that really got my attention was the split sunpads at the transom that provide a great walkway to the swim platform. Lift the port cushion and flip over the hinged filler cushion for a full beam sun lounge. Both lift to access the extra large storage bins. An electric ram lifts the sunpad and storage revealing a tidy engine compartment. The cockpit is in a word: roomy. The “J” shaped seating to port and starboard provides space and comfort and, with the wide beam, leg room as well. The refreshment centre features a sink with running water, wet storage, trash bin, 12-volt power and a refrigerator. Comfort and room for more crew is also found in the bow. The cushions are thick, the grab rails are solid and the storage compartments are finished. At the bow, a boarding ladder and anchor and rode are stored neatly in the anchor locker. For long days on the water, a head is a must. The 276’s is basic, but easily cleaned. The twin helm seats are bolstered and, unlike many, unlock, swivel and slide effortlessly. The helm is well designed, chartplotter well positioned and the switches easily identified and reached. 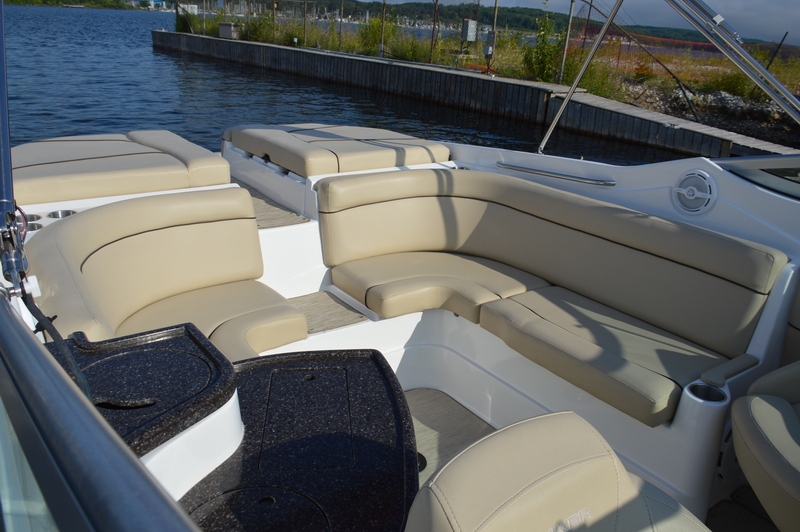 Powering this 2015 model is MerCruiser’s 377 MAG—a 6.2L 320 hp, fuel injected fully emissions compliant V8. With the Bravo 3 drive trimmed in and no tabs, the MerCruiser eased the 276 onto plane with some bow rise. Depending on load, deploying the tabs will ensure faster planing times and less bow rise. 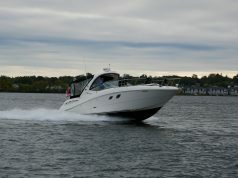 The 276 is a family boat built for comfort. The ride is smooth and dry. Turns are precise and the counter rotating propellers stay hooked up unless pushed into an extremely tight turn. Not a normal manoeuvre, but something that we test. This boat was featured in the 2017 Spring issue of Boats&Places.